The constructors of inherited classes are called in the same order in which they are inherited. For example, in the following program, B’s constructor is called before A’s constructor. The diamond problem occurs when two superclasses of a class have a common base class. 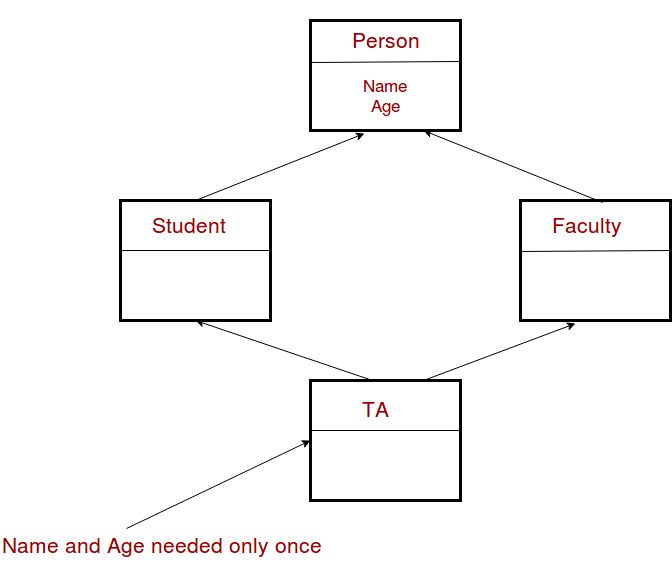 For example, in the following diagram, the TA class gets two copies of all attributes of Person class, this causes ambiguities. For example, consider the following program. In the above program, constructor of ‘Person’ is called two times. Destructor of ‘Person’ will also be called two times when object ‘ta1’ is destructed. So object ‘ta1’ has two copies of all members of ‘Person’, this causes ambiguities. The solution to this problem is ‘virtual’ keyword. We make the classes ‘Faculty’ and ‘Student’ as virtual base classes to avoid two copies of ‘Person’ in ‘TA’ class. For example, consider the following program. In the above program, constructor of ‘Person’ is called once. One important thing to note in the above output is, the default constructor of ‘Person’ is called. When we use ‘virtual’ keyword, the default constructor of grandparent class is called by default even if the parent classes explicitly call parameterized constructor. How to call the parameterized constructor of the ‘Person’ class? The constructor has to be called in ‘TA’ class. For example, see the following program. In general, it is not allowed to call the grandparent’s constructor directly, it has to be called through parent class. It is allowed only when ‘virtual’ keyword is used. As an exercise, predict the output of following programs. first_page What happens when more restrictive access is given to a derived class method in C++?